The STEREO CANCELER is designed to sum the two stereo channels out of phase. This cancels all sound produced by lateral stylus movement and leaves all sound produced by vertical stylus movement. Used with a mono recording, the Stereo Canceler can be used to optimize phono cartridge azimuth, by adjusting for maximum cancelation. With a stereo cartridge and proper stylus, the Stereo Canceler can be used to listen to vintage vertical cut recordings like Edison Diamond Disc, Pathe Needle Cut and World transcriptions. The Stereo Canceler can also be used to confirm stereo to mono compatibility as might be required in broadcast environments. The Stereo Canceler uses a high quality fully shielded center tapped audio transformer to passively sum the two inputs out of phase. The output is taken from the secondary and applied to both output connectors. Hand wired machined gold Teflon RCA's provide high quality reliable connections. The really great features to take note of with the KAB Stereo Canceler are, I believe, the unique features vs price. Small demand products like these don't appeal to many manufacturers. 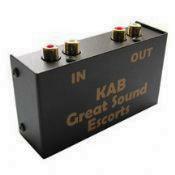 KAB specializes in small demand products just like these! When the azimuth of your phono cartridge is optimized, the vertical information will cancel or null out. This null is easily heard with a mono recording. Azimuth is the alignment of the stylus as viewed from the front of the turntable. The stereo ambience and "space" information also resides in the vertical channel. The canceler will let you listen to that alone if you wish. Check channel balance of mono feeds, or confirm stereo to mono compatibility of a a two channel feed.